Home Technology kodak new phone ektra!!! Kodak and Bullitt Group have announced the launch of the Kodak Ektra, a brand new smartphone aimed at photographers. It runs on a deca-core MediaTek Helio X20 clocked at 2.3GHz along with 3GB DDR3 RAM. It will sport a 5-inch Full HD display along with the usual connectivity options like 4G-enabled Nano SIM slot, GPS, Wi-Fi 802.11 ac, Bluetooth v4.1, 3.5mm audio jack, FM radio, and USB Type-C port. Coming to the main features of the camera-phone, Ektra is equipped with a 21MP Sony Exmor RS sensor on the back. The Exmor RS sensor comes with Phase detection Auto Focus (PDAF), Optical Image Stabilization (OIS), and f/2.0 aperture along with dual-LED flash. The company has also added a 13MP camera module on the front with PDAF and f/2.2 aperture. The smartphone is equipped with ambient light, accelerometer, proximity and gyroscope sensors. The smartphone will offer manual mode with control on shutter speed, white balance, ISO and focus, but no aperture controls. The smartphone is covered with artificial “leatherette” material and metal sides to give it a retro look along with a curved grip. The camera hump on the back may seem like a proper DSLR-grade sensor and camera lens, but sadly it is the same mobile camera sensor and lens. The industrial design and form-factor remind of point-and-shoot cameras with the shutter button. The smartphone will come with stock Android Marshmallow 6.0.1 out of the box, though there was no announcement of Android Nougat 7.0 or the upcoming Android Nougat 7.1. It packs 32GB internal storage and expandable memory slot of up to 128GB. The device will run on 3000mAh battery and sport “Pump Express quick charge technology as reported by Engadget. Kodak has added DSLR-interface to the smartphone along with, Kodak Camera app, Super 8 app to recreate the classic Super 8 film stocks, new Prints app for online prints and bundled Snapseed editing app. Also, the camera will be bundled with MobiSystems OfficeSuite and FileCommander as reported by Anandtech. Kodak wants to sell this camera to consumers who want to capture great photos and post them on the fly after editing, directly from their phone. This is an attempt by the company to revive the original Ektra brand. Its original camera was released in 1941, around a time when Kodak was known for its cameras. The company has fallen out of relevance ever since because of changing landscape and digital camera. The company fought bankruptcy through 2012 and 2013 and weathered the storm by selling its patents and businesses. 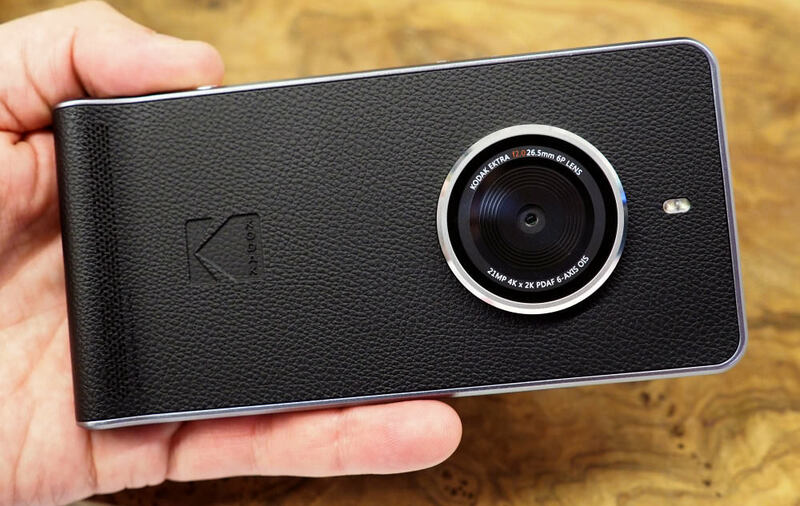 Kodak and Bullitt Group have announced the launch of the Kodak Ektra, a brand new smartphone aimed at photographers. It runs on a deca-core MediaTek Helio X20 clocked at 2.3GHz along with 3GB DDR3 RAM. It will sport a 5-inch Full HD display along with the usual connectivity options like 4G-enabled Nano SIM slot, GPS, Wi-Fi 802.11 ac, Bluetooth v4.1, 3.5mm audio jack, FM radio, and USB Type-C port. Coming to the main features of the camera-phone, Ektra is equipped with a 21MP Sony Exmor RS sensor on the back. The Exmor RS sensor comes with Phase detection Auto Focus (PDAF), Optical Image Stabilization (OIS), and f/2.0 aperture along with dual-LED flash. The company has also added a 13MP camera module on the front with PDAF and f/2.2 aperture. The smartphone is equipped with ambient light, accelerometer, proximity and gyroscope sensors. The smartphone will offer manual mode with control on shutter speed, white balance, ISO and focus, but no aperture controls. The smartphone is covered with artificial “leatherette” material and metal sides to give it a retro look along with a curved grip. The camera hump on the back may seem like a proper DSLR-grade sensor and camera lens, but sadly it is the same mobile camera sensor and lens. The industrial design and form-factor remind of point-and-shoot cameras with the shutter button. The smartphone will come with stock Android Marshmallow 6.0.1 out of the box, though there was no announcement of Android Nougat 7.0 or the upcoming Android Nougat 7.1. It packs 32GB internal storage and expandable memory slot of up to 128GB. The device will run on 3000mAh battery and sport “Pump Express quick charge technology as reported by Engadget. Kodak has added DSLR-interface to the smartphone along with, Kodak Camera app, Super 8 app to recreate the classic Super 8 film stocks, new Prints app for online prints and bundled Snapseed editing app. Also, the camera will be bundled with MobiSystems OfficeSuite and FileCommander as reported by Anandtech. Kodak wants to sell this camera to consumers who want to capture great photos and post them on the fly after editing, directly from their phone. This is an attempt by the company to revive the original Ektra brand. Its original camera was released in 1941, around a time when Kodak was known for its cameras. The company has fallen out of relevance ever since because of changing landscape and digital camera. The company fought bankruptcy through 2012 and 2013 and weathered the storm by selling its patents and businesses.